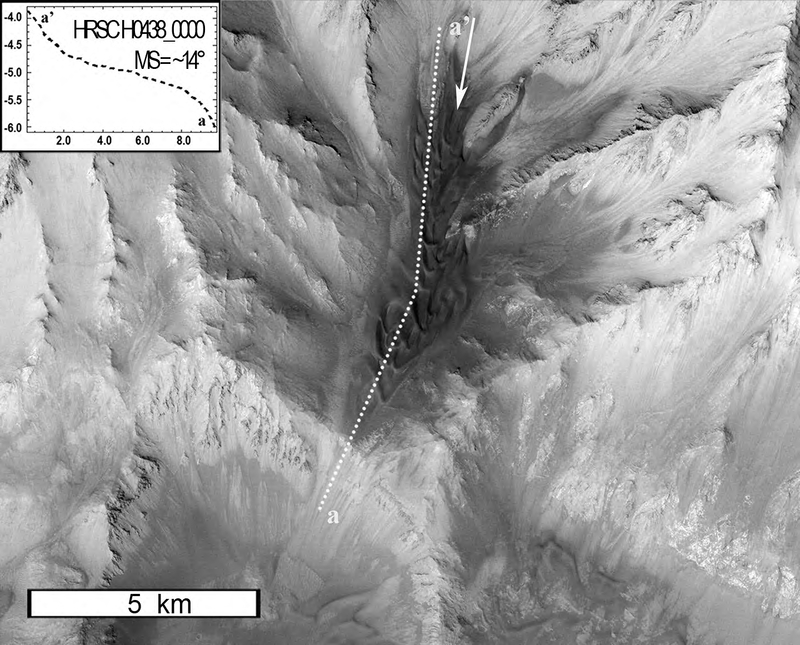 East Coprates Chasma hosts multiple occurrences of falling dunes found several kilometers above the Valles Marineris canyon floor (Image 3). 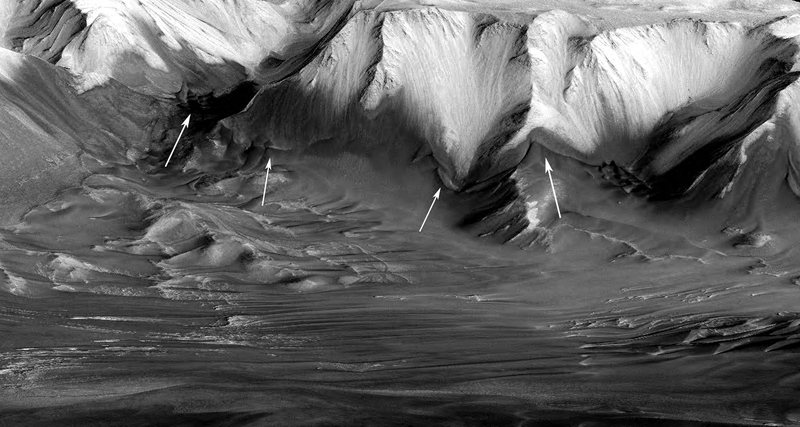 These falling dune fields are perched high above the chasma floor and located mostly within gullies. Presumably, down slope winds are funneled down gullies assisting gravity to develop these falling dunes (see below). 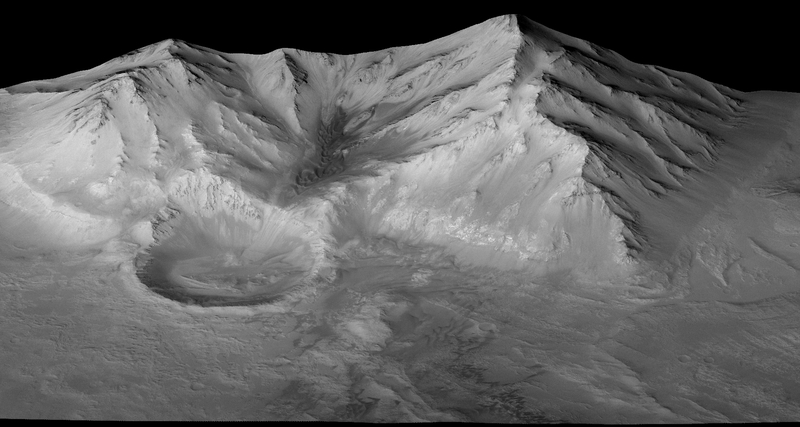 These intriguing aeolian morphologies are the result of a wind environment largely dictated by the micro- and mesoscale topography and the large relief of Valles Marineris. 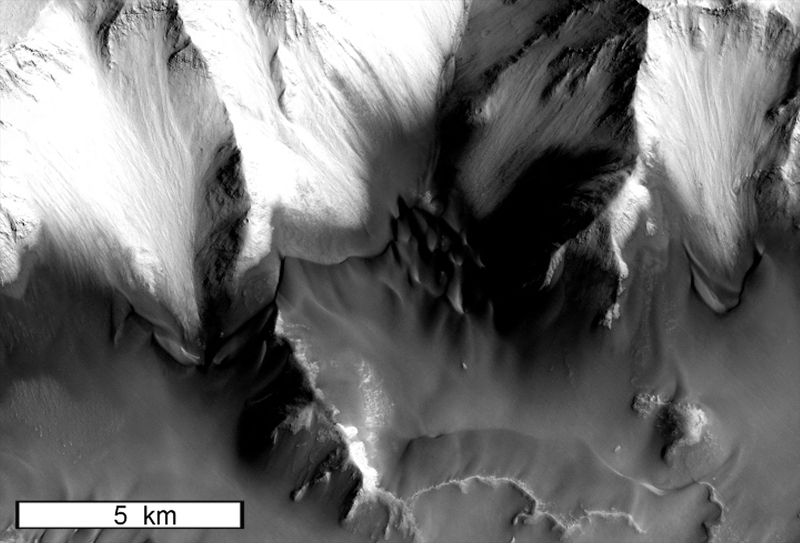 For example, falling dunes found in Coprates Chasma often have horns pointing upwind (Image 3-5a). In contrast, the majority of terrestrial and Martian crescent-shaped dunes that occur on relatively flat topography have horns pointing downwind [Greeley and Iversen, 1985; Pye and Tsoar, 1990]. 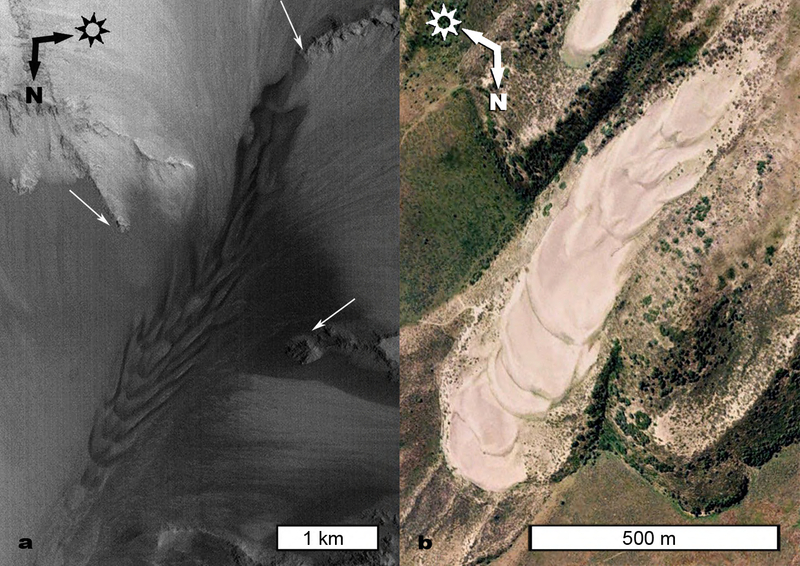 Several falling dunes in the U.S. Great Basin have strikingly similar arcuate, lobate morphologies and orientations (Image 5). This morphology suggests slip face advancement occurs at a greater rate towards the center of the dune as compared to the flanks, presumably due to a higher velocity and/or more consistent airflow over the center of the dune [Chojnacki et al., 2010]. Chojnacki, M., and J. E. Moersch (2009), Valles Marineris Dune Fields: Thermophysical Properties, Morphology, and Provenance, in Lunar and Planetary Institute Science Conference Abstracts, vol. XI, p. Abstract 2486. Greeley, R. and Iversen, J.D., 1985. Wind as a geological process on Earth, Mars, Venus and Titan. Cambridge Planetary Science, 4,. Cambridge University Press, Cambridge, 333 pp. Koscielniak, D. E. (1973), Eolian deposits on a volcanic terrain near Saint Anthony, Idaho, M.A. thesis, State Univ. of N.Y., Buffalo, N.Y.
Pye, K., and H. Tsoar (1990), Aeolian sand and sand dunes, Unwin Hyman, London.